International Festival of Authors: What's in it for young writers? International Festival of Authors: What’s in it for young writers? The International Festival of Authors (IFOA) is a Toronto-based, non-profit festival that celebrates the accomplishments of novelists, poets, playwrights, short story writers, and biographers from around the world. The festival itself runs annually, but IFOA hosts many other events throughout the year. We were able to ask Maeve O’Regan, the Communications and Marketing Coordinator for the festival, to answer a few questions about IFOA. 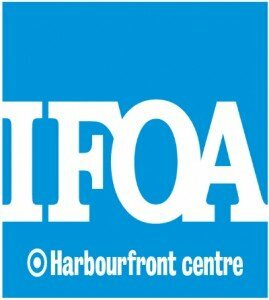 In what ways has IFOA grown since its creation in 1974? Our beginnings were quite humble; we hosted small events with mostly local writers. We actually didn’t introduce our annual festival until 1980. Now, we’re home to a weekly event series from September to June, the annual International Festival of Authors in October, and, for younger readers, YoungIFOA in October and ALOUD: a Celebration for Young Readers with Forest of Reading® Festival of Trees™ in May, presented with the Ontario Library Association. In 2007, we introduced our touring program, IFOA Ontario, which visits communities in numerous cities and towns across the province. How can teens get involved with the festival? One of the most exciting ways teens can get involved with IFOA is through a contest we run each fall with Open Book: Ontario called Write Across Ontario. It’s a creative writing competition open to middle and high school students across the province. We ask students to write a story in 500 words or less, using the story-starter provided for their age group by one of four well-known authors. The story-starter is used as a place for students to begin their story, but where the story goes from there is in the hands of each individual. We select one winner from each age group for a total of four winners, who each receive $500 and the opportunity to have their work published online in Open Book Magazine! Tickets to all Festival and IFOA Weekly events are actually free for students and youth 25 and under with ID! What events throughout the year are geared towards young writers? Young readers and writers can enjoy several book- and writing-focused events throughout the year. As mentioned above, there’s the Write Across Ontario competition in the fall and then the Forest of Reading® Festival of Trees™ each May. During March break and in the summer, we run a Junior Authors Camp, where kids can learn the tricks of the trade. In October, students have a chance to meet an author and get hands-on in a bookplate-making workshop during YoungIFOA’s School Visits program, which happens as part of the International Festival of Authors. When is your next event for kids? Our annual Forest of Reading® Festival of Trees™ event happens May 14 and 15, 2014 here at Harbourfront Centre. It’s Canada’s largest literary event for children, and we welcome approximately 8,000 of them to the site for this two-day awards celebration! The winners of each Forest of Reading® category are announced and celebrated alongside young readers. Each day has ceremonies with live entertainment, as well as workshops with the nominated authors and illustrators. How does the festival use social media to promote events and opportunities? We are active on Twitter and Facebook, where we tweet and post about upcoming events and ticket giveaways and share links to book reviews, interviews, and general book news that we think will be of interest to our followers. Who are some memorable authors who have been IFOA guests in the past? There are too many to name! The Festival and weekly series together have held readings, round table discussions, interviews, and performances involving over 8,500 authors from more than 100 countries, including 21 Nobel Laureates. Some recent memorable guests include Margaret Atwood, Joseph Boyden, Anne Carson, Eleanor Catton, Lynn Coady, Charlotte Gray, Guy Gavriel Kay, Stephen King, Yann Martel, Philipp Meyer, Lisa Moore, Thomas King, and Meg Wolitzer. You can keep track of the International Festival of Authors’ events and competitions on Twitter and Facebook. For more information about IFOA, visit their website at ifoa.org.